Parenting is for the weak. That may not seem to make sense but stick with me. I've been feeling completely worn out lately. Four boys keep me running all hours of the day… and night. A nursing baby who thinks mommy is his own personal pacifier makes it tough to get a good night of sleep. Even on a good day, this parenting thing is tiring. And then there are those really bad days. You know the days? The ones when everything those crazy boys do gets on your nerves. The days that make you feel like you're losing your mind. And there are days that I long for bedtime when they will all go down and my job will be done for that day. Then I hear the one who can't settle causing trouble with his talking. Then someone comes out because they can't sleep. And suddenly, I'm yelling at them to go to sleep and I'm storming down the hallway flinging threats. I'm hit with the reality that parenting doesn't stop at the end of the day. My job doesn't end at sundown. I know I'm not alone. You don't have to hide or deny it. Why? Because I know that parenting is for the weak. Too often I've thought I had to do this parenting this on my own. I have to be the best. Don't show weakness. Don't let the kids see you struggle because they will take you down. Recently I had the opportunity to read a book that has helped me turn my mindset around. 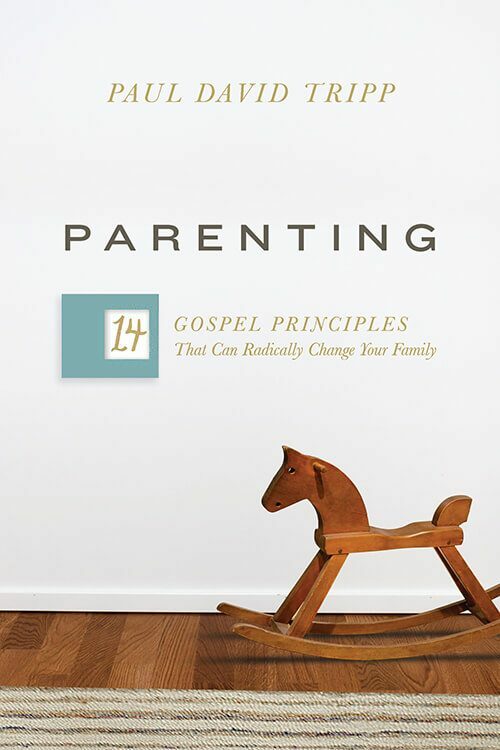 I was sent a copy of Parenting: 14 Gospel Principles That Can Radically Change Your Family by Paul David Tripp to read and share with you. My pastor quotes Paul David Tripp regularly. Dr. Tripp is a pastor, author, and speaker. He's written many books on Christian living related topics. His heart is to help people see how the Gospel speaks hope in practical ways to the things people experience in a broken world. He's also a dad with four kids. I've never read one of Dr. Tripp's books before this one but I was confident it would be an enjoyable and enlightening read. I didn't expect Parenting would follow so closely along with my current study of Romans and I certainly didn't expect that it would be one of those books that would change my life. I read a lot and it's easy to say that I liked a book or that a particular book was good. This one is different. I didn't expect this to be one of those books that I would give a place of respect and reference on my bedside table. But, Parenting has earned that status for me. Does Dr. Tripp have cameras in my house? Does he have spies in my head? I feel so inadequate to parent these crazy boys God has given me. I want a magic 3-step process to raising good kids. But, God doesn't give me that. He gives me himself and expects me to offer the same to my kids. Dr. Tripp explains that these simple formulas are helpful, but those formulas are useless if we do not have a foundational understand of parenting with the Gospel in mind. Parents are not owners of their children. Instead, they are ambassadors of God to their children. It's my job as a mom to represent God. To speak and act for Him. To make an invisible God visible for my kids. To do that, I must know God and then show Him to my kids. Dr. Tripp unpacks 14 principles rooted in the Gospel that should shape your understanding of your role and responsibility as a parent. I marked up Parenting so much that there's no way I could share a list of favorite quotes and insights with you. Doing so would border on copyright infringement! Every time I turned a page I was faced with another realization about myself and my fallen sinful nature. Each page gave me a new insight into why parenting is hard and how my biggest enemy is me. In the end, my biggest takeaway is this: Parenting requires relationship. First I must have a relationship with God. Then I must have a relationship with my children. My relationship with my kids needs to be rooted in telling and retelling the God's redemption story, over and over again, through my words and my actions. I must tell that story day in and day out knowing that I'm not capable of saving my children and I'm not able to raise them on my own. In my weakness, God has called me to parent. He wants me to rely on His strength not my own. See? Parenting is for the weak. 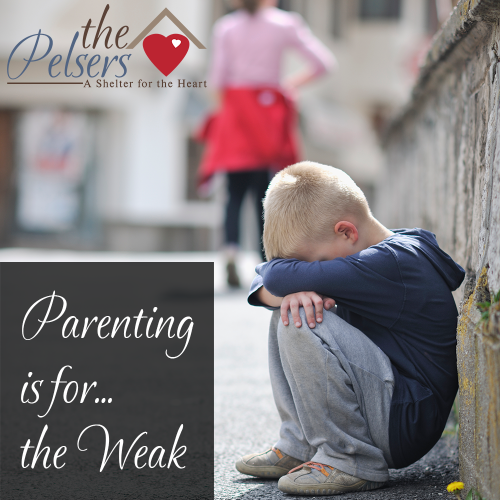 Tell me in the comments: What is currently your biggest parenting struggle? I think my biggest struggle is keeping my cool when we’re all in a cycle of seeming chaos. I just downloaded the first chapter and am reading it now – you weren’t kidding about it being convicting! Oh my, your review gave me the chills! I think my biggest struggle is remembering how young my kids are. I tend to expect more of them than I really should at the tender ages of 4 and 5. I often get irritated at them for being kids and kills me at the end of the day when I see all those moments running through my head. I keep reminding myself that they’re His children. I wouldn’t be so impatient with someone else’s children so remembering that they’re not really mine helps. My biggest struggle is consistency. I am so thankful for the opportunity to win this book! My huge challenge right now is trying to parent my kids alone, while we all heal from a painful divorce situation. This is by far the hardest season of my life that I have had to endure. Thank goodness for God’s mercy and grace! I’d say my biggest parenting challenge is finding balance between my different roles (wife, mom, daughter, friend, etc.). I’m home all day with my only child who demands my constant attention and I haven’t figured out how to get him to be more independent so I can get other things done and give other people attention. My biggest parenting struggle is having patience when I’m not feeling well. Which due to having a chronic pain condition and frequent migraines, is often. Thank you for this great post. Keep them coming! Wow, it sounds like this book is for me too! I struggle with my own weaknesses and most of the time feel like a failure as a mom. God keeps reminding me of His grace and for that I am eternally thankful! I struggle with getting distracted. My biggest struggle is keeping up with the demands of my almost 9 month old (and the pediatrician). My little one is still pretty clingy and needs to be able to see me at all times but also wants to do everything herself. She is eating often (breastfed and solids throughout the day), but then not gaining the weight she “should” so I feel the judgement of not being a good enough mom and like I’m failing my daughter. This is an amazing article! Thank you so much for writing this! This is exactly how I feel today. My biggest struggle is the fact that my boys fight all day. I don’t know if this is a boy thing or what, I never fought with my sisters my whole life, and my kids seem to never stop fighting. It is so hard! I pray they learn to get along better! This book sounds amazing I will have to pick up a copy! Oh to pick just one struggle with parenting. lol I would say consistency. I get tired an worn down, then that goes to yelling. I think my biggest struggle is remembering to be nice. My kids are people. With feelings. I need to be nice to them. Even when they are in trouble, etc. Truth is I have a lot of things I wish I could change. I wish I was more organized, more diligent with Bible study; but most of all I want to make sure that when my babies look back they were able to see Jesus in me. I pray that I would show them that it’s all about HIM. Focusing on the most important aspect of pointing them to Jesus. Not just reacting to circumstances. I want to be proactive in parenting. My biggest parenting struggle is connecting with them in a meaningful way. parenting a 14 year old teenage girl!!! My biggest struggle is consistency and talking without yelling. I think this book would be a great blessing to me and my little guy. Just one? 😉 I would say consistency when it is busy which leads to a lot of yelling. Helping a child who is prone to anger. My biggest struggle is moving forward on days where they are whiny and arguing and being hateful to one another. Then I feel so busy getting involved with that that when there is peace I just want to relish it and have some me time and not clean the kitchen, do the dishes or laundry, or pick up toys. My biggest struggle is having a happy heart when everything is crazy. I want to choose joy but often struggle to do so. I struggle with being very task oriented, get the job done and do it now! I forget about having better interaction with my kids and enjoying their sometimes crazy conversation. I’m trying to stop and listen, and encourage the older ones to open up more and say something, anything! We have 4 girls-13, 10, 5, and almost 3. I’m struggling with making sure everyone gets some time from mommy because I also run a business from home. It seems everyone needs me all the time. There are no breaks to catch my breath or relax. My biggest challenge is organization/schedule and keeping my daughters all getting along. My biggest struggle is being selfless when I want to be selfish! My biggest struggle is not yelling. My biggest parenting struggle is being a parent!! Everything parenting! I have no idea how to parent or be a parent. Hardest job I’ve ever had hands down!